Yevgeniy Kolesnichenko introduces FC Shakhtar’s interactive museum at Donbass Arena, which is currently the most technologically-advanced in Ukraine. In August 2009, FC Shakhtar Donetsk in Ukraine, the last UEFA Cup Winners, moved to their new state-of-the-art home ground, the Donbass Arena, which is the first Eastern European stadium originally designed and built to UEFA’s Elite standard. And while the Donbass Arena’s heart is its vociferous and never-ceasing Fans’ Stand, the FC Shakhtar Museum, which opened last summer, has become the venue’s soul. 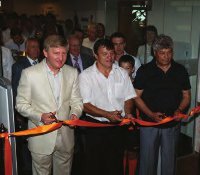 On July 14, 2010, the Club’s President, Rinat Akhmetov, the head coach, Mircea Lucescu, and Mikhail Sokolovskiy, a Pitmen’s legend who played the most matches for Shakhtar (485) ever, snipped the ribbon and the museum received its first visitors. With an exhibition space of 384sqm, this is the biggest sports museum in Ukraine. 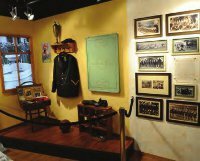 The colourful arrangement of exhibits depicts every minute detail of the team’s formation and growth from football coming to the region to the Pitmen’s most recent achievements. The museum’s five rooms showcase a rich seam of the Pitmen’s history for the visitors to explore. The awards and trophies won by the squad, the unique historical records and photos are all on display there. 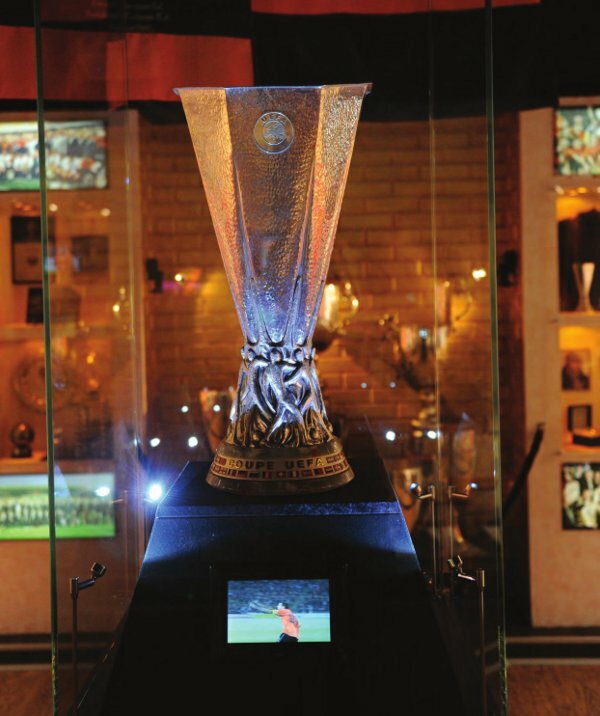 The UEFA Cup won by FC Shakhtar Donetsk in 2009 also takes pride of place. ”It took us about two years to carry out the project, finishing and showcasing works took another half-year. Currently this is the most technologically advanced interactive museum in Ukraine,“Andrei Babeshko, the FC Shakhtar Museum’s Director and initiator pointed out. 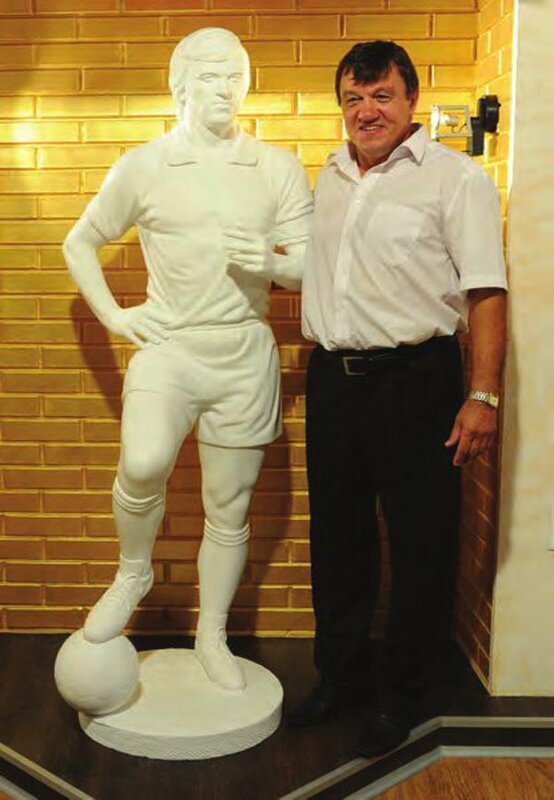 Most visitors are impressed with the 23m long Wall of Fame, alongside which genuine palmprints and footprints of legendary footballers and coaches of FC Shakhtar, made from molten metal cast in plaster moulds, are situated. The Wall itself encompasses photos and video footage, capturing every significant moment in the Club’s history, and featuring its most outstanding representatives. Three of the museum’s rooms feature full-size gypsum statues of the most iconic personalities in the club’s history: Oleg Oshenkov, Vladimir Sal’kov, Mikhail Sokolovskiy and Vitaliy Starukhin. Visitors love having photographs taken in front of the images, as well as next to various trophies displayed at the museum. ”It was impossible to present all the photos and videos within one exhibition, therefore we decided to use multimedia in order to display the entire photo archive. Besides this we have a cinema hall, and have plans to make an electronic filing system to put together videos, photos, and statistics, alongside the archive of printed materials,“ explained Babeshko. The museum’s numerous entertainment options became its distinctive feature. Here, in a homely 25-seater cinema, visitors can watch the squad's most interesting matches, pop into a special PlayStation room, play football with friends on an interactive pitch, or hammer a penalty into the net of Dynamo Kyiv - the archrivals of FC Shakhtar. Donbass Arena in Donetsk, Ukraine, will host Group stage matches and the Finals in next year’s UEFA European Championships (EURO 2012). However, besides football matches, the stadium is also a venue for concerts and shows. 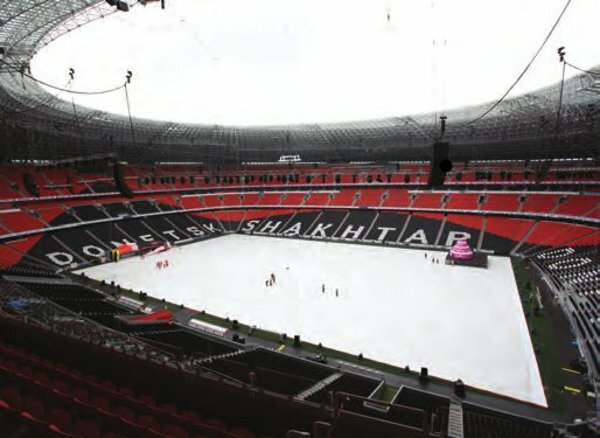 On May 14 2011, a ’Grand Show’ was held at Donbass Arena, dedicated to FC Shakhtar’s 75th Anniversary celebrations. 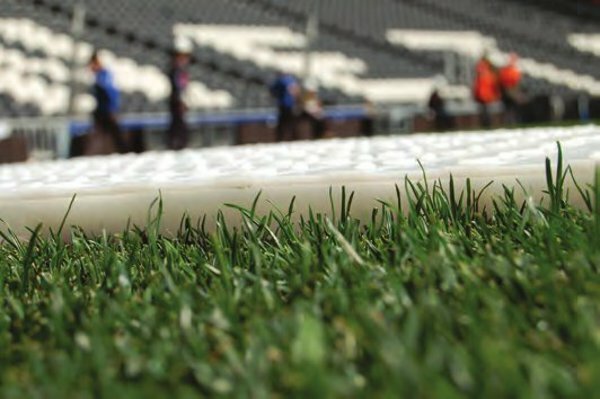 One of the major issues faced by the stadium management was how to protect the pitch from damage both during the preparations and the event itself, which featured Rihanna. ”Our goal is to make it so that our visitors become fans of FC Shakhtar upon leaving the museum. lf at least one person a day turns into a Shakhtarfan, it will mean that the museum fulfils its function...“ - Andrei Babeshko, the FC Shakhtar Museum’s Director and initiator. 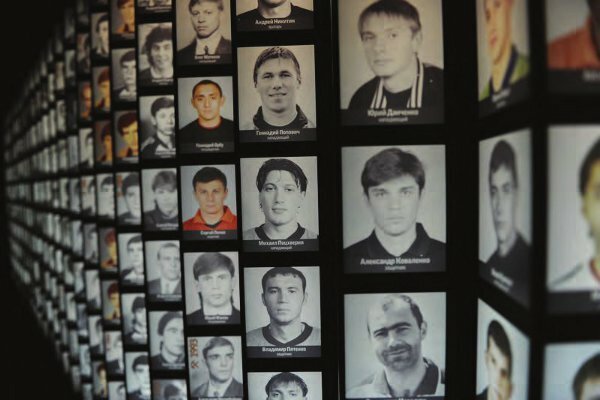 An exciting virtual insight into the history of FC Shakhtar awaits visitors inside the showroom, featuring photos of all the players that have ever defended the colours of the most successful squad in Donbass. A FogScreen projection screen (one of only two in the whole of Ukraine) is placed in the centre, which produces a thin curtain of ”dry“ fog that serves as a translucent projection screen, displaying images that ’float’ in the air. An interactive performance involving the image of FC Shakhtar goalkeeper, Andriy Pyatov, unexpectedly emerges from a dark background, welcoming visitors to the Donbass Arena, literally sends the museum audience into raptures. When they pass through the curtain of fog, the roaring sound of the arena's stands descends upon them, making them feel like they are present in the stands during a match. Author’s Credits: Yevgeniy Kolesnichenko, translation by Maksim Fedorenko.